Winter Skin Protection - Naturally Healthy Nails - Amphora Aromatics Ltd – Supplier of pure essential oils and aromatherapy Products. Winter Skin Protection! How to ensure your nails are kept healthy, strong and durable the natural way. The cold weather can have a terribly negative effect on our nails and cuticles. They can become dry and brittle and can develop even more serious problems if left untreated. Eating foods rich in Vitamin B7 (biotin) is a great way to ensure your nails remain strong and healthy through the winter months. Green leafy vegetables, broccoli, avocados and nuts such as almonds and walnuts are a great natural source of this vitamin. Nail health is very much dependent on cuticle health and, as you’d expect, here at Amphora we have a product just for that. Our Nail and Cuticle Oil is designed to give you a high grade, 100% natural product that will moisturize and strengthen your nails. It contains a blend of Jojoba, Vitamin E, Sweet Almond and Rice Grain. The 10ml bottle comes with a nail brush in the lid to make application easy and mess free. Myrrh – Its anti-inflammatory properties make it a popular choice for use on nails. It nourishes and protects, helping to heal and strengthen brittle nails. Sandalwood – Moisturising and restoring. 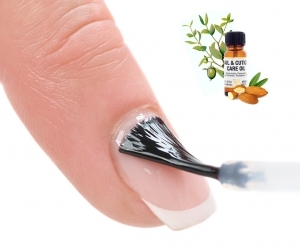 Sandalwood oil will help your nails to grow more quickly whilst maintaining their strength. Lavender – Helpful in treating brittle nails. Lavender will strengthen and protect your cuticles and, with regular use, its antiseptic and fungicidal properties will help ward off any infections. If you add essential oils then please be sure not to chew or nibble your nails for a couple of hours after application.